You should complete Get started with Azure Monitor Log Analytics before completing this tutorial. You can work through this exercise in your own Log Analytics environment, or you can use our Demo environment, which includes plenty of sample data. Queries can start with either a table name or the search command. You should start with a table name, since it defines a clear scope for the query and improves both query performance and relevance of the results. The Kusto query language used by Azure Monitor is case-sensitive. Language keywords are typically written in lower-case. When using names of tables or columns in a query, make sure to use the correct case, as shown on the schema pane. The query starts with the table name SecurityEvent - this part defines the scope of the query. The pipe (|) character separates commands, so the output of the first one in the input of the following command. You can add any number of piped elements. Following the pipe is the take command, which returns a specific number of arbitrary records from the table. We could actually run the query even without adding | take 10 - that would still be valid, but it could return up to 10,000 results. This query searches the SecurityEvent table for records that contain the phrase "Cryptographic". Of those records, 10 records will be returned and displayed. If we omit the in (SecurityEvent) part and just run search "Cryptographic", the search will go over all tables, which would take longer and be less efficient. By default, a time range of last 24 hours is set. To use a different range, use the time-picker (located next to the Go button) or add an explicit time range filter to your query. That could return too many results though and might also take some time. 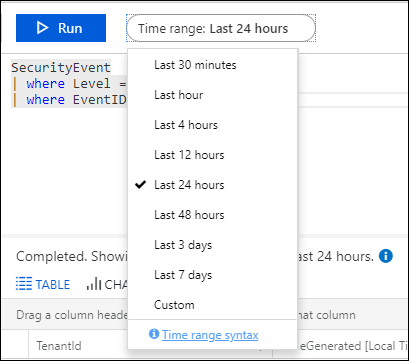 The above query sorts the entire SecurityEvent table by the TimeGenerated column. The Analytics portal then limits the display to show only 10,000 records. This approach is of course not optimal. Filters, as indicated by their name, filter the data by a specific condition. This is the most common way to limit query results to relevant information. and, or Required between conditions Level == 16 or CommandLine != ""
The time picker is next to the Run button and indicates we’re querying only records from the last 24 hours. This is the default time range applied to all queries. To get only records from the last hour, select Last hour and run the query again. In the above time filter ago(30m) means "30 minutes ago" so this query only returns records from the last 30 minutes. Other units of time include days (2d), minutes (25m), and seconds (10s). Select only the Computer and TimeGenerated original columns. Rename the Activity column to EventDetails. Create a new column named EventCode. The substring() function is used to get only the first four characters from the Activity field. extend keeps all original columns in the result set and defines additional ones. The following query uses extend to add a localtime column, which contains a localized TimeGenerated value. Use summarize to identify groups of records, according to one or more columns, and apply aggregations to them. The most common use of summarize is count, which returns the number of results in each group. Grouping results can also be based on a time column, or another continuous value. Simply summarizing by TimeGenerated though would create groups for every single millisecond over the time range, since these are unique values. | where Computer == "ContosoAzADDS2"